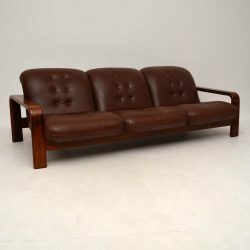 A top quality and extremely comfortable Danish sofa in solid Rosewood and brown leather upholstery. This dates from around the 1960-70’s and it’s in great condition for its age. 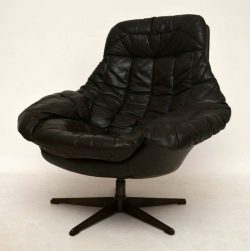 The leather has a little wear and fade to the seat area, it’s worn a little thin in one or two places, seen in the images. The solid rosewood frame has just a little minor wear here and there. The three seats each lift out individually for ease of transport. 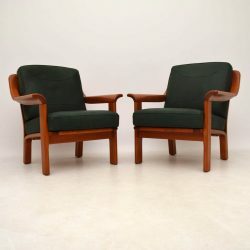 A top quality and very comfortable pair of solid Teak and leather armchairs, these were made in Denmark and they date from around the 1970’s. They are in superb condition for their age, with only some extremely minor wear here and there. 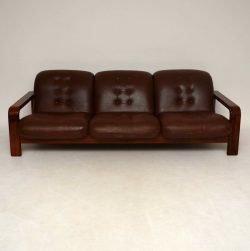 We also have the matching three seat sofa and a matching single armchair available separately, please see listed under our other items for sale. 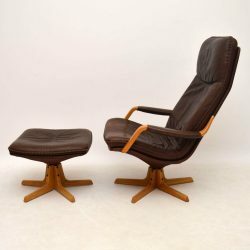 A top quality and very comfortable solid Teak and leather armchair, this was made in Denmark and it dates from around the 1970's. It is in superb condition for its age, with only some extremely minor wear here and there. 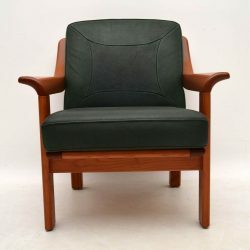 An extremely stylish and comfortable Falcon chair, this was designed by Sigurd Ressel and was made in Norway by Vatne Mobler during the 1960-70's. 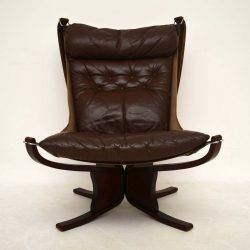 The condition is excellent for its age, the brown leather has a lovely colour and feel, with no rips or tears. The bentwood frame is also in lovely condition, with only some minor wear here and there. This has an unusual variation on the base which we've never seen before. 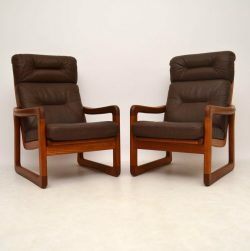 A very stylish and extremely comfortable pair of solid Teak armchairs with brown leather cushions. 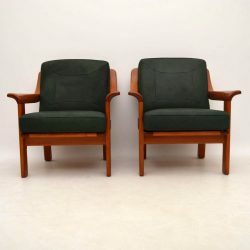 These were made in Denmark by EMC furniture, they date from around the 1970's. They are in excellent condition for their age, with only some minor wear here and there. One of the seat cushions has a tiny hole, seen in the images. It looks like a very small burn hole, it's hardly noticeable and as it's not a tear it's unlikely to get any worse. 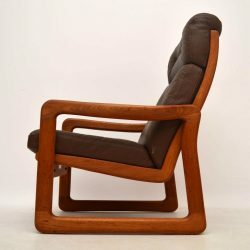 A stylish and very comfortable Danish teak armchair, this dates from around the 1960’s. 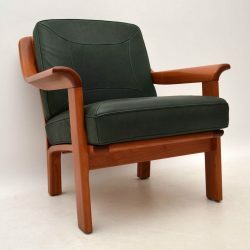 We have had this newly upholstered in our lovely light green fabric, and the solid Teak frame is nicely polished, with only some extremely minor wear. Overall the condition is superb for its age. 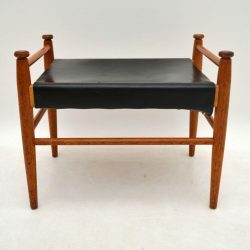 A very stylish and top quality Danish foot stool in Teak and leather, this dates from around the 1960's. It is in superb condition for its age, with only some extremely minor wear here and there. 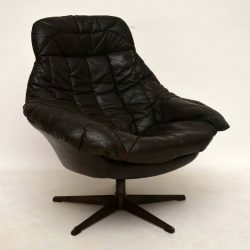 A top quality and extremely comfortable leather armchair, this was made in Denmark by Berg, it dates from around the 1970’s. 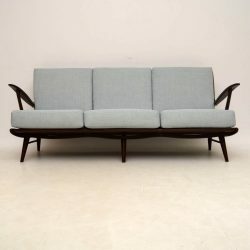 We cannot overstate just how comfortable this is! 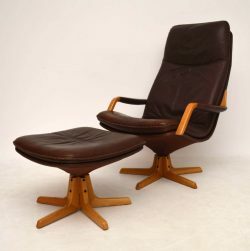 It’s upholstered in beautiful brown leather, which has some minor wear and fade, but is in excellent condition throughout. The solid Oak frame is clean, sturdy and sound. 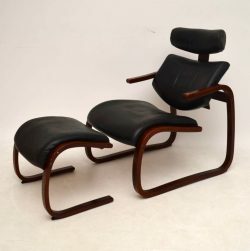 Both the chair and the stool swivel and have tilting mechanisms, with a lever on the side of each to lock them in place. 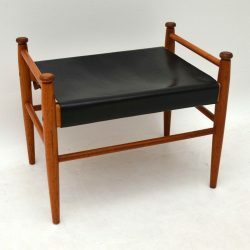 A stylish, top quality armchair and stool in bentwood and leather, this was made in Norway by Rykken & co. It is ergonomically designed and extremely comfortable, the lower back rest is built on a pivot, and the headrest is adjustable. 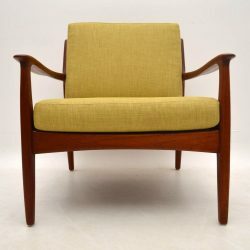 This dates from the 1970’s and the condition is superb for its age. 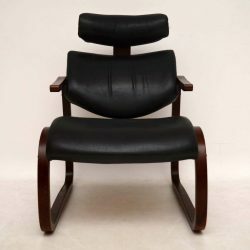 There is only some extremely minor wear to the frame and leather, there is some very slight darkening to the middle of the headrest which is barely noticeable. 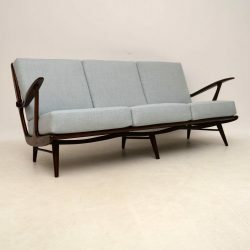 A stunning sofa from the 1950's, this was imported from Denmark and it's in excellent condition for its age. The frame is Cherry wood, it's clean, sturdy and sound with only some extremely minor wear here and there. We have had the cushions newly made and upholstered in our lovely light blue fabric. 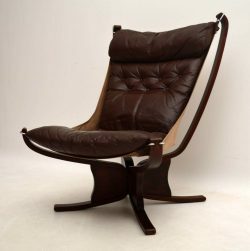 A smart and very comfortable Danish leather armchair, this was made by Bramin and was designed by H.W Klein. 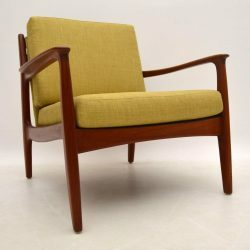 This dates from around the 1960's, it's in good condition for its age, with some minor wear here and there. There are some minor marks to the leather in places, overall this has a lovely colour. It sits on a splayed metal base, one of the plastic feet caps is missing. 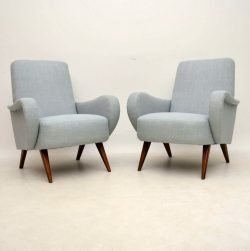 A stunning pair of Danish armchairs from the 1950-60's, these are excellent quality and are in amazing condition. 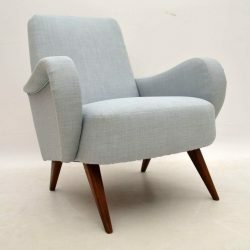 We have had these newly re-upholstered in our lovely light blue fabric.